I was invited to perform stand-up comedy at the MSA Gala Dinner this weekend. It is odd being called a stand up comedian. Not a title I'm used to. Slightly older audience than I expected but I gave it a shot. Here is some of my material from the event. Let me know what you think. Asalaam u alaikum. My name is MJ Khan. Some of you may know me from my blogs or twitter account, although I suspect more of you may have seen me at spur. Not that I work there – but… (gestures to tummy). I have been part of the MSA during my studies and now support it from the periphery. I see some of the old guard sitting in the audience tonight. The Muslim seniors association. Before I begin, I would like to address clapping. I tweeted Mufti Menk last night and asked him to follow back if clapping at an event was haraam (not permissible). He didn’t so Alhumdulillah, its all good. But that’s the thing about Mufti Menk. Mufti Menk does not follow back. He doesn’t 'follow Friday' , he doesn’t Retweet, he doesn't 'hashtag thank allah its jumuah', Nothing! But imagine if Mufti Menk did follow you on twitter? It will put a stop to all subtweeting, random tweets swearing the aunty that cut the line at woolies and will eliminate selfies by 40 percent. I love social media (its what I do for a living) and I love how we interact on twitter and facebook and what have you. But there is a line! And that line is crossed whenever some guy instagrams himself in the act of qurbani. I urge you my brothers; don’t instagram your qurbani. 'Aint nobody got time fo that'. Picture this, the sheep is on the ground, takbeer is resounding through the air, you’re holding the knife and have made your niyyat. Youre supposed to be reflecting on the essence of Abraham's sacrifice and connecting with your lord but instead, you’re like "riaaz, check my goney, dala the thing on lo-fi LO-FI. Hashtag selfi". I see some of the older people are looking at me strangely. Lo-fi is a filter or camera effect that people use to replicate the best lighting location for taking a self portrait (illustrates taking a selfie) . That is (pause), a toilet. Don’t get me wrong. I’m looking forward to eid. Its my favourite Eid. After eid ul fitr. Who is your favourite South African muslim role model? South African so Zayn Malik doesnt count! Give a round of applause for hashim amla. I love hashim. What a fantastic role model for the muslim youth. Speaking of jumuah, This week I went to the Marlboro musjid. By a show of hands, how many of you have been to the Marlboro musjid. Now im not going to say they have a space problem, but you know your musjid is cramped when the saffs are so small, you don’t know whether youre reading jumuah or janazah salaat. Some brothers take the shoulder to shoulder thing too seriously. Sometimes I feel like I am on mastersaff (acts as a judge who is checking if there is a fist-space between feet). We need to address the gap issue in the musjid. Some Musalees are too optimistic. there was a space the size of a miswak in front of me. So the uncle next to me motioned for me to fill the gap. ‘Now brother, im not sure whether you think that I’m a transformer or something, but theres no way that i’m going to plug that gap. I am a fully grown man, not poly-filla. And it got me thinking. Imagine if we had more taxi drivers who converted to islam. We wouldn’t have any gaps in the safs anymore. Moment, there is a gap, the taxi driver will move forward. I get happy when Muslim brothers diversify. But I think the Halaal bodies are taking it too far. Certifying water. Milk and toothpicks! Why do you need to certify toothpicks? Soon they are going to start certifying chandeliers. (points to chandelier in hall). This one will be haram! but on the other hand, we have brothers who are diversifying the Ummah. Brothers like the majlis. Hashim amla. Riaad Moosa. Zain bhikha. Shaikh Saadullah. You! The one thing majlis hates more than everyone is banks. Standard bank. Fnb. Absa. Beep bank. (takes out a copy of the majlis) All banks deal with RIBA and are haraam. Then lower down on the same page 'for subscription, please deposit 360 rands into savings account'! 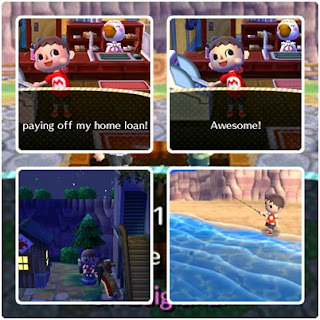 One of the most frustrating things in Animal Crossing is when my constituents ask me to hand over my freshly caught fish (especially the rare ones - no one asks me for sea bass). It is a tough one really, as on one hand I could get 9000 bells for it (or more if it is the special of the day) but on the other hand, I am terrified of said charity-case leaving my town. I would love the inhabitants of Luigiana to pitch in and help my pay for a bridge, fountain or even a small park bench. Am I the only mayor who has a town full of mooches? Sometimes, all I want to do is fish (and not use it as a means of paying for a police station). Zelda: Ocarina of time was great in this regard as it just let me fish for fun. The more I play Animal Crossing, the greedier I get because I want to pay of that lamppost, I want a bigger house, I want, want, want! I also have to deal with nosy folks like this guy, and while I do feel sorry for him (we all feel insecure at times) I would like to think that my town is inclusive and loves all, furry and unfurry. As you could tell, animal crossing has shifted from being a fun bit of escapism to an integral part of my day. The competition ends on Friday but I know that I will be playing this well into the festive season. Badge collecting is my new obsession. I'm not sure whether it stems from me not being a boy scout,or my diagnosed pokemonitus (gotta catch em all fever) but I have to collect badges! Strangely, I care more about Animal Crossing badges than xbox 360 achievements. As we enter the last week of the Nintendo challenge, I urge all my readers to vote for me in the challenge. You could end up with a limited edition 3DS XL (fantastic console). All you have to do is click on this link and click 'like' under my name. Then send through an e-mail to the address on the tab to be entered into the draw. Afrihost has a great twitter competition running at the moment, so to separate myself from the pack I am going to write a blog piece on it. I want to win! They are launching a mobile data offering and would like to know why we would need #Afrihostmobile. I imagine it would come in handy for the pending zombie apocalypse. I would use it to access my GPS for google maps, check-in to Facebook to alert my friends to my whereabouts, and to download appropriate apps like Plants vs Zombies 2 and the Walking Dead. Luckily, years of load-shedding has prepared us for the eventual black-out. Candles at the ready! Leave your weave behind! Ain't nobody got time fo that! Its no use spending the afternoon at Makro stocking up on Koo beans if you don't have a can opener. Plan wisely. Contrary to popular belief, playing Die Antwoord at a loud volume is not an effective zombie deterrent. try Danny K instead. Animal Crossing is a lot like Viva Pinata, in that both titles offer relaxing escapism from the more twitch-driven games we find today. I spent the last few days paying off my home loan (something I have yet to do in real life) and fishing. Oh my God I am wasting my life fishing! The third image is something that reminded me of Big Brother SA season one. For those of you old enough to remember, I am referring to 'Ferdie in the bushes'. I will be posting more updates during the week so check back as I conquer Luigiana. Until then, don't forget to vote for me in the competition by clicking 'like' under my name. Do so and I will name something after you.